Recover deleted email messages in WorldPosta Webmail. When you delete an email accidentally, you can recover it from the Deleted Items folder. Also, you can recover a deleted folder with all of its messages from the Deleted Items folder. 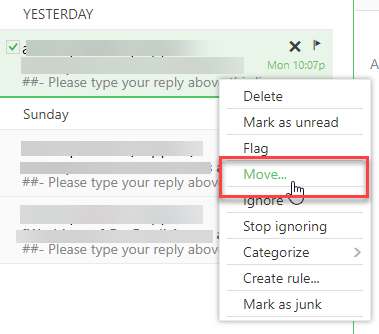 When you delete an email, it goes directly to the Deleted Items folder, if you are searching for a deleted message, then the check the Deleted Items folder first. 1. Open the Deleted Items Folder. 4. Select the destination folder from the list, and then click OK.
To recover the permanently deleted emails. 1. Right-click on the Deleted Items folder and then select Recover Deleted Items. 2. A new window will appear, contains all the permanently deleted emails. 3. Right-click on the message you want to recover, then select Recover. Mail items to the Inbox. Calendar items to the Calendar folder. Tasks to the Tasks folder.